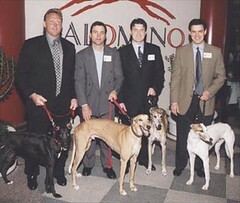 GALTs Annual Greyt Champions Hockey & Hounds Benefit Dinner and Auction was held on Monday, March 24th at 7:00 p.m. at Palomino Euro Bistro located at 500 Crescent Court in Dallas. One hundred and eight greyhound supporters joined GALT Honorary Chairman Craig Ludwig and former Dallas STARS Neal Broten, Gerald Diduck and Alan May along with Master of Ceremonies, Bob Sturm of SportsRadio 1310 The Ticket for a spectacular event! The evening began at 7:00 p.m. with greyt wine, delicious appetizers, schmoozing with the retired athletes  both humans and greyhounds - and silent auction item displays! The delicious three course dinner (your choice of three entrees) was served at 8:00 followed by Palominos famous trademark Tiramisu for dessert with coffee. GALT Chairman of the Board John McQuade spoke about GALTs goals for its kennel here in the metroplex and GALTs new kennel affiliation in Harlingen at Valley Race Park. He told of the retirement life waiting on these greyhounds once they cross over, and how important it is to get the word out about greyhounds as companion pets. Bob Sturm interviewed Craig, Neal, Alan and Gerald about Old Time Hockey and were there stories to tell!!! The guys mixed and mingled with the attendees, signing autographs and posing for pictures. It was a Greyt evening for all! This was followed by a live auction of items generously donated by the Dallas STARS Hockey Club, which brought in some $$ and heated bidding! The silent auction closed at 9:30 with all the winning bidders extremely happy. GALTs Annual Greyt Champions Hockey & Hounds Benefit Dinner and Auction was an evening of good conversation, delicious food, and silent/live auctions, all for a GREYT cause - these wonderful greyhounds! GALT would like to thank the following people for their team efforts in making this annual event the most successful ever. And to numerous others who volunteered their time and energy for the love of the greys - THANK YOU! All proceeds support and care for GALT's Greyhounds.